After one game in the last seven weeks – enough time for Leeds to change manager three times, Jesse Lingard to ‘earn’ an England call-up and Daniel Sturridge to have six injuries – the Marlins took on regular rivals Gremio at Jinqiao. Having won three of their four fixtures so far this season – a season that started in August – the Marlins were keen to get more points on the board ahead of what stops England from winning any tournament…the winter break. Gremio are as consistent in their style of play as they are in punctuality. Having ten players available for the first 15 minutes provided them an opportunity to start on the back foot and look for the long ball over the top whether it was from fullback or central midfield. Shanghai Marlins meanwhile had a depleted squad due to work and family commitments or being dressed as a pigeon firmly under the thumb of someone in Taiwan…McGoo! Despite the lack of players, practice and match fitness, the Marlins started the game with the sort of attacking intent only matched by Dale at an open bar. The early pressure didn’t result in an opening goal but there were gaps to exploit once the final ball was mastered. With Gremio now able to field 11 players, the Marlins stopped being charitable and leaned towards clinical. Gui Leclerq was a persistent threat on the last man and as Wilson Scott played him in down the left channel, the Frenchman cut inside the right back before unleashing an unstoppable shot into the far top corner. It was postage stamp stuff and a deserved lead for the boys in blue. Gremio coincidentally grew into the game as their squad increased. They threatened on a number of occasions as their striker was in a one-on-one battle with Dale Johnson in the Marlins’ goal. The English keeper was foiling his opponent with the help of some desperate defending and the woodwork. But that barrier was eventually broken when Gremio capitalized on a fortuitous decision. The Marlins had a freekick in a dangerous position, which nearly resulted in a second goal, only for a Gremio thigh diverting a goal bound effort wide. Expecting a corner, the referee opted to go with his better (clearly worse) judgment and award a goal kick. Gremio quickly broke down the right before squaring it for a tap-in. One-one with around 15 minutes left of the first half. Little else happened and half time arrived. Gaffer Steve emphasised the need to retain possession better and not rush passes so often. There were periods of good football, but a combination of poor decision-making and execution in the final third was costing the side victory. 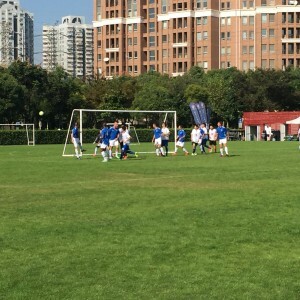 Perhaps the more technical and classy players were struggling with a Jinqiao pitch, which needed as much trimming as a 55-year old free-spirited, feminist Ayi in Zhejiang. The second half kicked off, once the officials had their exact 15 minutes break. Shanghai Marlins came out with renewed energy and focus, taking the game to their opponents. They pressed higher up the pitch, kept possession longer and looked the more threatening. But Gremio still had their long-ball tactic and target man looking to capitalize on any mistakes or lapses of concentration. Shanghai Marlins retook the lead following some good interchange between Wilson and Ale Ossandon down the left hand side. The bearded magician weaved his way through the defence before opening up his body and passing into the far corner. The Marlins were now 2-1 up. Within ten minutes, Gremio had leveled. A miss-hit pass kindly landed at the feet of the lone striker who turned and slotted the ball home. It was a deflating way to concede and a real test of the Marlins’ character, especially as they were threatening to get that all-important two-goal advantage. Instantly, the reigning champions replied. Gui found Wilson on the left from kick-off. Wilson then carried the ball towards a back pedaling defender before returning the ball to Gui. The Frenchman took aim from all of 25 yards, rifling a shot towards goal. It looked destined for the net as the keeper dived at full stretch. It cannoned off the inside of the post, heading towards the left side of the area. Wilson was quickest to react and his well-struck first time effort was punched clear by the keeper. Pete Rosselli picked up the loose ball on the right side of the area, turned his marker and approached the next defender. His two-footed lunge, whilst winning the ball, was deemed dangerous play and the referee awarded the Marlins a penalty. Pete was relieved he didn’t need to leave his foot in to claim a foul as his lack of insurance could have left him up the creek without a paddle. Gui took responsibility from 12-yards and made no mistake. Shanghai Marlins were leading for a third time. However, once again, a miss-hit shot by a Gremio player bounced into the ground, deflected off a Marlins defender and landed on the chest of the lone striker. He controlled the ball before volleying past Dale to claim his hat-trick. Shanghai Marlins tried to regroup and get a fourth goal as Gui saw a freekick deflect off a Gremio shoulder before striking the bar. He had another freekick in a more central position but apparently the wall no longer needs to stand ten yards from the ball. Instead, it should be ten baby steps as clearly demonstrated by the vertically challenged referee. It was seven yards according to Gui’s strides. It wasn’t the only curious display of officiating. With around 15 minutes to go (magic time reference for this game), Gremio took the lead. Their winger cut in from the left and shot from outside of the area. His effort was too hard for Dale to get a firm hand onto and it found the bottom corner…and a hole in the net, which Kevin the ref would have given a corner for had it been two seasons ago. Still bitter about that. Despite their best efforts, Shanghai Marlins couldn’t respond to another blow and salvage a point from the game. Gremio ran out winners on a frustrating and disappointing day for the Marlins. It’s another three weeks until the ERS game, which will be the last before the Christmas holidays. To keep up with the other teams, the Marlins will have to put in a big performance against the side that narrowly missed out on the title last season. On a more important note, this game was played under a dark cloud of grief following the atrocities in Paris the previous Friday. Unfortunately, it’s a sad reality that it often takes a tragic event or circumstance to put our own situations in perspective. We are incredibly lucky to have the opportunity to play football with our friends in a safe environment and this should always be appreciated and never forgotten. A minute’s silence was perfectly honoured out of respect to those who had their lives stolen and for a nation smarting from the inhumane and merciless actions of terrorists. Shanghai Marlins is proud and privileged to have two of its brothers from France. Gui Leclerq and Loic Chudy are patriotic men who will naturally be suffering more than most during this difficult time for their families and people. As proven both on and off the field in the past, when one brother suffers, we all suffer. So on behalf of the Marlins, let it be known that we are here for support. Allez les Bleus! Marlins back on track – just! After the disappointment of the Century Park Result, Shanghai Marlins needed to get back to winning ways in defence of their title. On a beautiful sunny day at Lan’an Stadium, Marlins were close to full strength with a megasquad of 20, watched by their loyal fans and a good contingent of passers-by. Marlins looked sharp from kick-off, and came close a couple of times before an in-swinging McGoo corner found the net courtesy of a deflection off an unfortunate Japanese defender. 1-0 and Marlins were cruising. Given the size of the squad (and the heat) manager Fishwick looked to change things round a bit at the half hour mark, unfortunately with disastrous consequences. Following a particularly chaotic substitution, where Marlins had either 10 or 12 players on the pitch, Super 48 took advantage with a great through ball and their pacey striker equalized coolly past Dale, who up to this point had barely touched the ball. 1-1, and things got worse within minutes when the tiny Japanese striker (their only man in the box) rose unchallenged amongst a forest of giant Marlins to nod home a second. 1-2, half time and some serious soul searching. To make matters worse playmaker Wilson was withdrawn with a deadleg, and Marlins heads were dropping. The second half settled into a disjointed pattern, with Marlins dominating possession and Super 48 looking to strike on the break. They nearly succeeded on a couple of occasions, but fortunately the returning Johnson (nearly 100%) was on fine form to keep them out. Increasingly desperate, Fishwick chopped and changed looking for the formula to unpark the Japanese bus. New striker Johnny White was introduced (“the best striker in Beijing except for me” according to Gui) and he had an immediate impact with a deft touch near the sideline taking out 3 Sunday Brunches in Blue Frog. Welsh Pete brought some much needed energy to midfield, and finally with 15 minutes to go Gui bundled home the equalizer at the far post. Not pretty, but a poachers goal. It was all Marlins now, and as the clock ticked down towards the final whistle they struck the decisive blow. After 85 minutes of gentle encouragement from Gui, Fabio finally got his crossing right and picked out Ironman Jamie G at the far post who made no mistake from 5 yards. 3-2. Still time for a couple of jittery moments but the Blues held on to take all 3 points. Next up are l ast season’s runners up ERS; we will need to be better.